neighbor to the north. And in Argentina, about the same number rate the U.S. favorably (42%) as rate it unfavorably (41%). U.S. President Barack Obama also receives higher marks in Brazil than in Argentina and Mexico; 56% of Brazilians have confidence in the American president to do the right thing in world affairs, compared with 49% of Argentines and 43% of Mexicans. 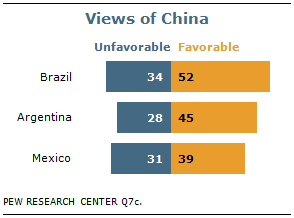 Views of China are also more positive in Brazil. While a slim majority of Brazilians (52%) give China high marks, fewer than half in Argentina (45%) and Mexico (39%) offer favorable opinions of the Asian superpower. When asked whether they consider the U.S. and China partners or enemies of their country, most Brazilians (56%) say the U.S. is a partner, while 45% say the same about China. About one-in-ten see each of these countries as an enemy, while many say the U.S. and China are neither partners nor enemies of Brazil. While Brazilians express confidence in Lula’s overall approach to world affairs, they largely disagree with him on how to handle Iran and its nuclear weapons program. The president has opposed additional international economic sanctions against the Islamic Republic. Yet, of the 85% of Brazilians who oppose Iran acquiring nuclear weapons, nearly two-thirds approve of tighter sanctions to try to prevent it from developing such weapons; 31% oppose tougher economic sanctions against Iran.1 Majorities of those who oppose a nuclear-armed Tehran in 18 of the other 21 countries surveyed also endorse such a measure. 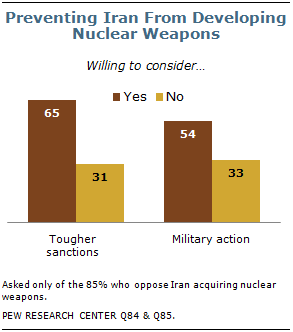 In addition, most (54%) Brazilians who do not want to see a nuclear-armed Iran are willing to consider the use of military force to prevent Iran from developing nuclear weapons; a third say avoiding a military conflict with Iran, even if it means it may develop these weapons, should be the priority. Overall, Brazilian views of Iran are among the most negative of the 22 publics included in the 2010 Pew Global Attitudes survey. About two-thirds (65%) express unfavorable opinions of Iran; a similar percentage of Americans (67%) and Egyptians (66%) offer similarly negative views, as do more than seven-in-ten in Spain, Japan, France and Germany. More than six-in-ten Brazilians say the media, foreign companies, religious leaders and the military are having a good influence on the way things are going in their country; a slim, 53% majority give the police similarly good ratings. Many Brazilians say gender inequalities persist in their country, and seven-in-ten say it would be a good thing for a woman to be elected president, putting aside their opinions about presidential candidate Dilma Rousseff. Of the 22 publics surveyed, Brazilians are among the most supportive of the free market approach; 75% agree that people are better off in a market economy. Only in China, Nigeria, India and South Korea is this view more prevalent. Venezuelan President Hugo Chavez receives the most negative ratings of five international leaders tested; just 13% have at least some confidence in him, while seven-in-ten say they have little or no confidence in the Venezuelan leader. 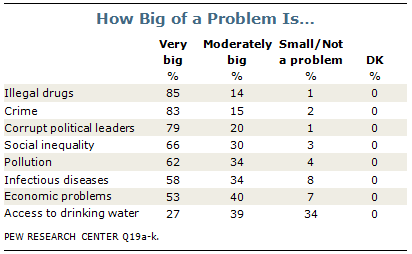 About half also lack confidence in Russian President Dmitri Medvedev. Brazilians express more concern about global climate change than any public surveyed; 85% say it is a very serious problem. Moreover, eight-in-ten say protecting the environment should be given priority, even if it results in slower economic growth and loss of jobs.